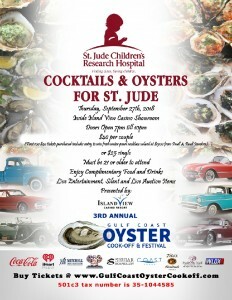 Enjoy a beautiful evening of entertainment by Starz Band, live & silent auctions with all proceeds going to benefit St. Jude’s Kids! The night will feature a wonderful complimentary menu by Island View Casino Resort including seafood favorites; Baked oysters, fresh raw oysters on the half shell a crab cake station, ready to eat boiled shrimp, BBQ meatballs and an assortment of fruits & cheese plus numerous desserts! You will also enjoy an open bar featuring Tito’s Handmade Vodka, Budweiser & Coca-Cola products.